Good ol’ ‘Murica may be ahead of China in development, GDP, and political clout, but China just finished building the world’s largest radio telescope and is now better-equipped at searching for aliens. According to Xinhua, about 300 “builders, experts, science fiction enthusiasts and reporters” watched the installation of the Five-hundred-meter Aperture Spherical Telescope, or FAST, in the southern Chinese province of Guizhou. The project took five years and $180 million to complete, and the reflector covers the area of roughly 30 football fields. 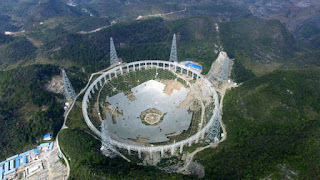 FAST is almost twice as large as the next biggest radio telescope, which is in Puerto Rico. It will be used for early-stage research by Chinese scientists for a couple years, and then be used more widely. FAST is capable of detecting gravitational waves, pulsars and, eventually, amino acids on other planets.